Happy Belated Valentine's Day! Because it's such a love centric week, I thought it might be a good time to share some of the details of wedding this past summer (July 24, 2010). Plus yesterday, my lovely husband reminded me that some church related publications had offered to include articles about our wedding if we authored them...so you're going to be my test audience. Here goes. When Alex and I started planning our wedding, we knew that our wedding day not only marked the marriage our of lives, but the joining of our families. We knew that most of all, we wanted to be surrounded by the people we loved and who loved us in return. We also knew that we wanted each and every part of the day to be a reflection of who we are as individuals and who we are together. And of course, like most other couples, we wanted to plan a unique party that our guests would love. To understand our wedding planning process, you must first know a little more about who we are. Alex and I met in the fall of 2006 through the Wesley Foundation, the United Methodist Campus Ministry, at the University of Virginia. We are both disciples of Christ, "stumbling students" learning to believe, with a tremendous respect for all of God's creation and for each and every one of God's children. For each of us, caring for the environment is one of the biggest ways that we live out our faith. For Alex especially, living a green lifestyle is a driving passion in his everyday work and life. Our love for the environment helped inform the majority of our wedding-related decisions. In our relationship, while Alex tends to "represent" the environment, I've always had a passion for people, God's children - for who they are, what they need, and what they bring to the world. Related to that is my background in architecture and design - a discipline largely about learning to meet basic human needs while shaping human experience in the world (through the manipulation of space, use of visual, auditory, and tactile elements, etc.). Along with that, I've always had a love of history, art, and culture. By combining our passions, our wedding day became a reflection of who we were, right then, as people of faith with a love for God's creation and everyone in it, embarking upon a new life together. There were so many thoughtful, meaningful decisions that went into our wedding that it's difficult to describe them all. 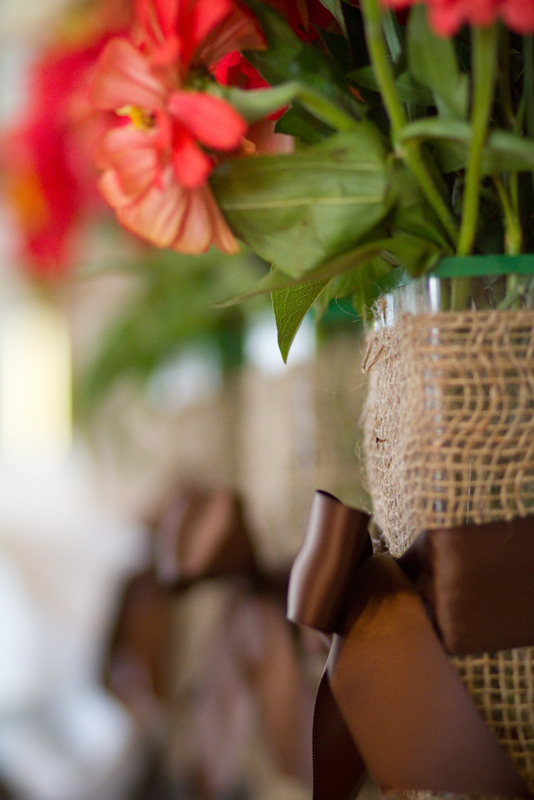 Ultimately though, our wedding most certainly falls within the category of "green weddings." For me, when I think of "green weddings" I often associate the term with expensive eco-tourism destination wedding packages or purely "organic" weddings with $5,000 organic wedding gowns and expensive organic food. You should know that Alex and I budgeted a mere $12,000 for a wedding with 150 guests. The average cost of an American wedding today is close to $30,000. That being said, we set several different "green" goals for ourselves during our wedding planning process. The first goal was that we tried to use local vendors whenever possible. By supporting local businesses, we helped support the people in our community and also, in some cases, helped reduce carbon emissions by ensuring that our vendors were close by. The second goal was to reuse items and find recycled/natural/compostable products whenever possible. It's always better to avoid excess energy consumption by purchasing new products and if you have to buy something new, make sure it doesn't end up in a landfill somewhere. The third goal was to generally keep emissions low and serve local, organic food. Reducing emissions whenever possible can improve our climate and local, organic food is better for our bodies and the environment. While balancing budgetary concerns, our desire for every element to be meaningful, and the needs of our guests, we tried our best to make our day as green as possible. The first major "green" element of the day was my wedding dress. On a spring break trip with the Wesley Foundation to Charleston, SC, I had been sorting dresses with a program called the Cinderella Project and found my $1200 Nicole Miller gown in the rack with a stain on it. We were told if we found anything with a stain to remove it from the rack and we could take anything we liked. So I did. I had it dry-cleaned and the stain came right out. Yes, my wedding dress was recycled (and free). Though Alex had to buy his suit new, he was wearing eco-friendly shoes (per usual for him). Another major element was the flowers. We arranged to purchase coral zinnias the day before the wedding from two local farms and supplemented with additional organic flowers from Whole Foods. Several of my friends and family members, under the direction of my mother (a former floral arranger), helped arrange the flowers before the wedding rehearsal. Unfortunately, many of them wilted in the refrigerator overnight but the ones that survived were lovely. The next piece was the decorations. My bridemaids (sisters especially) helped make most of the decorations. 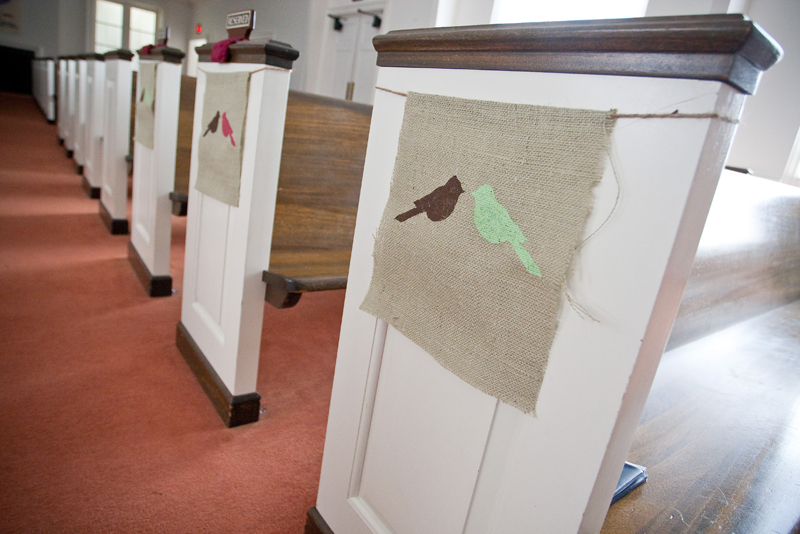 The pew decorations were made of natural burlap and at the reception, the table runners were made of unbleached muslin. The reception tables themselves and linens were all rented and would be reused by the company. We purchased the flower girls' baskets for $0.50-$1.00 each from a rummage store and revamped them with spray paint and a stencil. 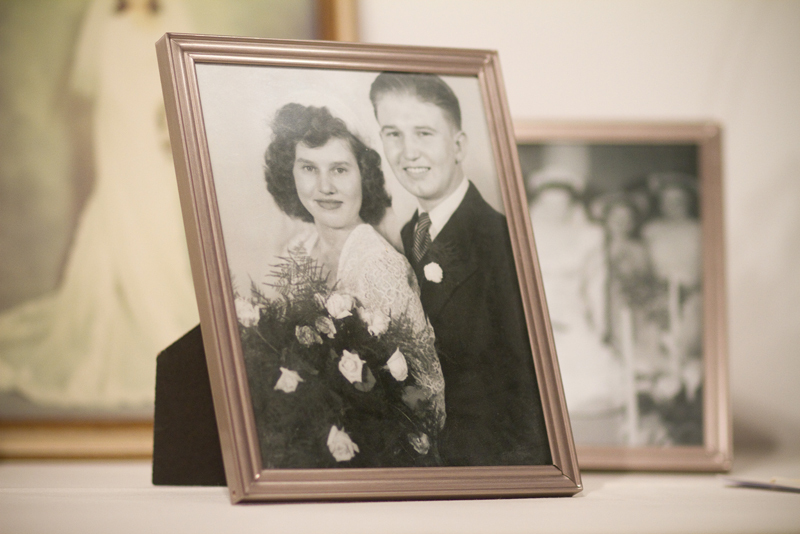 At the reception, I used recycled frames that my mom had leftover and framed old family photos to put on the tables. The reception venue was also a key piece. We chose McGuffey Art Center in Downtown Charlottesville for our reception. While I was attracted to the character of building and the beautiful artwork alone, we also loved that it was an old elementary school (built in 1916) that had been re-purposed into an art gallery and studios for local artists. Re-purposing older buildings and changing their program rather than demolishing and building new is an incredible way to keep material out of landfills and to preserve the history of a community. I also knew that my family, which is chock full of artistic talent, would love the atmosphere of the space. The one unfortunate downfall was that because of its age, the building lacked central air conditioning and our wedding happened to fall on the hottest day of the year. On the bright side, think of all of the energy we saved by not cooling the building to 75 degrees! Another major consideration was how our guests would travel from our ceremony to our reception. Ideally, we would have had them both in the same place or within walking distance. 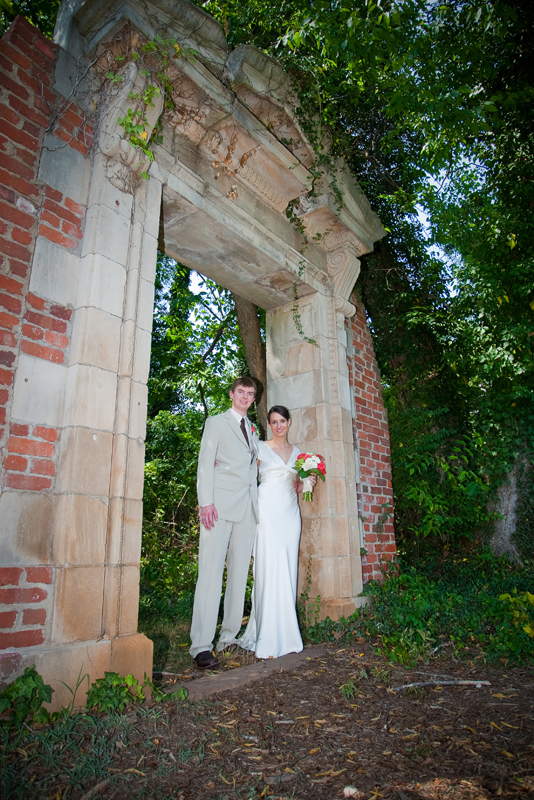 Because we chose to have our ceremony at our church (an incredibly meaningful place for us) and our options for reception venues nearby were cost-prohibitive or generally unsuitable, we had to explore other options. Instead, we were given the incredible gift of a University Transit Bus by several amazing friends of ours to transport our guests. The University Transit Bus system runs on biodiesel - a clean burning alternative to regular diesel made from plant products or recycled cooking oil. By providing a bus, we allowed our guests the opportunity to save fuel and money by carpooling. Finally, the food. We purchased our cakes from a local bakery and found an up-and-coming caterer who fit our budget and was willing to buy ingredients from the farmer's market. We planned to rent dishes and cutlery that were reusable but they were too expensive -- as an alternative, we bought plates made of sugar cane and cups and cutlery made of corn starch. All of the paper products were compostable. We did a few other little things like buying recycled paper invitations, recycled paperback CD cases for our favors, having our programs printed at a locally owned shop, and choosing a honeymoon spot within driving distance, but all in all, we were pleased with the choices that we made and the relatively low price tag of the day. Looking back, I'm confident that though there are a few things I might change, the day was a perfect reflection of our life together.